The Panther was a direct response to the Soviet T-34. First encountered on 23 June 1941, the T-34 decisively outclassed the existing Panzer IV and Panzer III. At the insistence of General Heinz Guderian a team was dispatched to the Eastern Front to assess the T-34. Among the features of the Soviet tank considered most significant were the sloping armor, which gave much improved shot deflection and also increased the effective armor thickness against penetration, the wide track and large road wheels which improved mobility over soft ground, and the 76.2 mm gun, which had good armour penetration and fired an effective high-explosive round. Daimler-Benz (DB) and Maschinenfabrik Augsburg-Nürnberg AG (MAN) were tasked with designing a new thirty to thirty-five-ton tank, designated VK3002, by April 1942 (apparently in time to be shown to Hitler for his birthday). The two proposals were delivered in April 1942. The Daimler-Benz (DB) design was a direct homage to the T-34, side-stepping the German propensity for over-engineering and, hence, complexity, to produce a clean, simple design resembling the T-34 in hull and turret form, diesel engine, drive system, leaf spring suspension, track layout, and other features. In the DB design, like the T-34 design, the internal crew layout provided for two men: the commander would also have to serve as the gunner. This provided the advantage of a smaller, inexpensive turret design, as well as manpower savings, and a smaller target for enemy gunners to hit during a battle. The MAN design was more conventional German thinking: it was higher and wider with a substantial turret placed centrally on the hull, a petrol engine, torsion-bar suspension, and a characteristically German internal crew layout for three men: commander, gunner, and loader. The MAN design was accepted in May, 1942 in spite of Hitler's preference for the DB design. One of the principal reasons for this was that the MAN design used an existing turret designed by Rheinmetall-Borsig while the DB design would have required a brand new turret to be designed and produced, substantially delaying the commencement of production. A mild steel prototype was produced by September 1942 and, after testing at Kummersdorf, was officially accepted. It was put into immediate production with the very highest priority. The start of production was delayed, however, mainly because there were too few specialized machine tools needed for the machining of the hull. Finished tanks were produced in December and suffered from reliability problems as a result of this haste. The demand for this tank was so high that the manufacturing was soon expanded out of MAN to include Daimler-Benz and in 1943 the firms of Maschinenfabrik Niedersachsen-Hannover (MNH) and Henschel & Sohn in Kassel. The initial production target was 250 tanks per month at MAN. This was increased to 600 per month in January 1943. Despite determined efforts this figure was never reached due to disruption by Allied bombing, manufacturing bottlenecks, and other difficulties. Production in 1943 averaged 148 per month. In 1944, it averaged 315 a month (3,777 having been built that year), peaking with 380 in July and ending around the end of March 1945, with at least 6,000 built in total. Strength peaked on September 1, 1944 at 2,304 tanks, but that same month a record number of 692 tanks were reported lost (source: T.L. Jentz (1999) Die deutsche Panzertruppe Band 2). 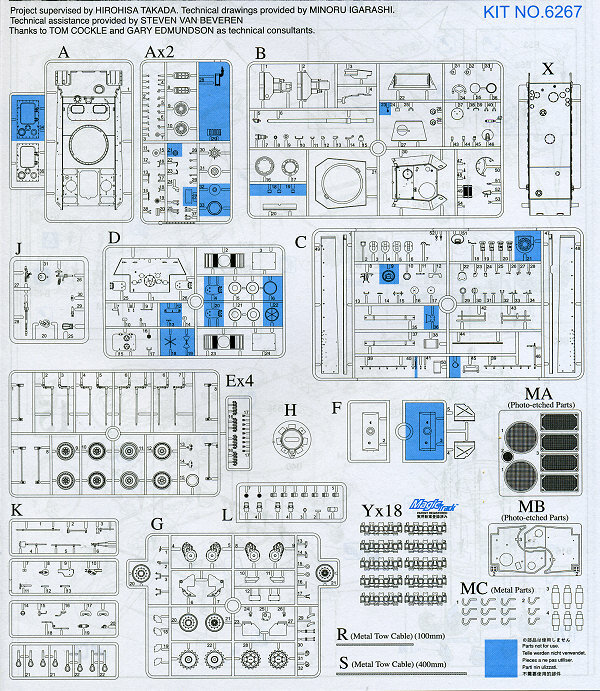 Keeping with Dragon's policy of having everything you need to build a quality replica in their Smart Kit line, this one is jam packed with parts and sprues. With a total of over 650 parts, Dragon is right to list this as being for experienced modelers. You get Dragon's Magic Track individual link tracks as well as two photo etch sheets with intake screens and roof armor. Another bag has hooks and standoffs for the armor. As you can see by the scan of the parts layout, there are more than enough pieces to keep a modeler quite happy for a long time. Of course, several sprues are duplicated. Some of the highlights of this kit are a turret with accurate weld patterns, the aforementioned turret roof armor, correct road wheel arrangements for an early production G, new cable heads, two types of engine fan, full torsion bar suspension, two types of exhaust guard and much more with a lot of parts molded by the new 'slide mold' technology that allows much greater detail. As with all Dragon kits, the instructions are superbly done with well drawn construction steps. Detail drawings are also given when needed. Paint references are Gunze and Model Master. All three tank options are from Pz. Rgt.26 in Italy during 1944 and differ only in hull number. 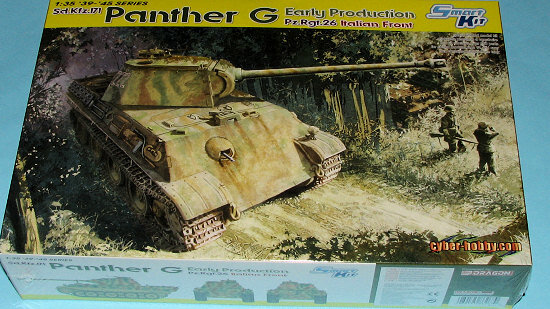 They are in overall Panzer Yellow with heavy brown and green segmented camouflage as shown on the box art. The small decal sheet is quite well printed and should work just fine with this kit. So here you have it, another superlative kit from the Dragon folks. Just in case you are wondering about why the kit is marked as 'Cyber-Hobby' vice 'Dragon', it means that this kit is a one time production run of a specific variation. It also means that if you want this one, you need to get it now as it will not be reissued. It should build into a real beauty. My thanks towww.dragonmodelsusa.com for the review kit. You can get this and other fine Dragon kits at your local retailer. If they don't have it in stock, have them order one for you.